Ubud is a town in central Bali and regarded as the cultural centre of the island. It is famous as an arts and crafts hub, and much of the town and nearby villages seems to consist of artists’ workshops and galleries. There are some remarkable architectural and other sights to be found, and a general feeling of well being to be enjoyed, all thanks to the spirit, surroundings, and climate of the place. The easiest way to get to Ubud from the Airport and the regions in South Bali is via taxi. Some taxis are metered, but many drivers will want to set a rate before leaving, generally around IDR 300,000. 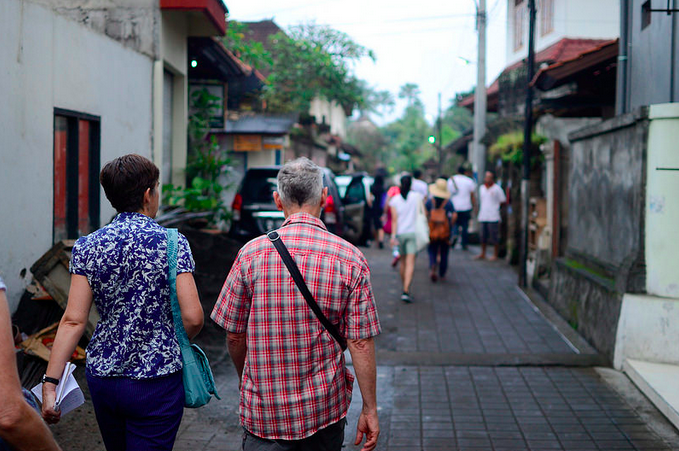 Orienting yourself in Ubud is fairly straightforward. The town sprawls for several kilometres in all directions, with all of the small villages within a five km radius of the central market being loosely referred to as ‘Ubud’. If you choose a reasonably central place to stay, it is easy enough to get around on foot. Central Ubud has three main streets: Jl Raya Ubud, Jl Monkey Forest and Jl Hanoman. At the intersection of Jl Raya and Jl Monkey Forest are Ubud Market, Ubud Palace, and the main bemo stop — unsurprisingly, there’s also a near-permanent traffic jam here. Jl Monkey Forest, which runs south through town to the Monkey Forest, is a built-up area, and home to a wide array of accommodation, art galleries, and cafes, as well as a number of local services such as schools, a sports field, pharmacies, and travel agents. Jl Hanoman, which runs parallel to Jl Monkey Forest just to the east, is a bit quieter. To the immediate west and northwest are the villages of Campuan (Tjampuhan, Campuhan) and Kedewatan, home to some of the most upmarket hotels in the whole of Asia, with views over valleys sculpted by the Ayung and Wos rivers. Directly to the south, past the Monkey Forest and still within a twenty minute walk of the central market, is Padang Tegal which then runs into the southern villages of Nyuh Kuning and Pengosekan, about three km from central Ubud. Directly to the east is the village of Peliatan, and then Teges and Bedulu, home of the ninth century Goa Gajah (Elephant Cave). Most local transport comes in the form of SUVs or minivans that can be hired with a driver for specific trips. Look for the circular yellow “E” logo on the windshield certifying them as Ubud Transport Association members. You can (and should) haggle over the price, and pay less than for the equivalent journey in a metered taxi. A short trip should be not more than Rp 30,000, and drivers will be glad to wait for you for a return fare. As elsewhere in Bali, motorbike rental is widely available, and you will not be short of options. Riding a motorbike in Bali is not for the faint-hearted though, and unless you have an international motorcycle license, not legal. This option should only be considered if you are an experienced rider in your home country. Expect to pay around IDR 50,000 per day for a late model motorbike in good condition. Look for rental agencies on all the main streets, or ask your hotel to organise one for you. If you’re not comfortable riding a motorbike yourself, you can always catch a ride on an Ojek, or motorbike taxi. You can rent bicycles for about IDR 20,000-30,000 per day. The roads in Ubud are not ideal for bike-riding, as there is traffic and no designated bike lane, however a trip through the rice-paddies is a lovely way to spend an afternoon. Ubud is quite hilly, so make sure you are prepared for a workout! The area code for Ubud is 0361, so +62 361 XXXXXX for international callers. All of the major Indonesian mobile telephone networks have full coverage of the Ubud area. If you need to make an international landline call, there are many public phone shops (wartels) in the town. Most dedicated internet cafes provide computers with fairly low speed access at a low price. For the fastest connection in town, head to Monkey Forest Road to find Hubud, a community co-working space offering access by the day or package of hours – refreshingly, Skype is encouraged! In cafes and restaurants free wifi for customers is increasingly widespread. If you have your own laptop and don’t need high speeds that’s probably the easiest option.